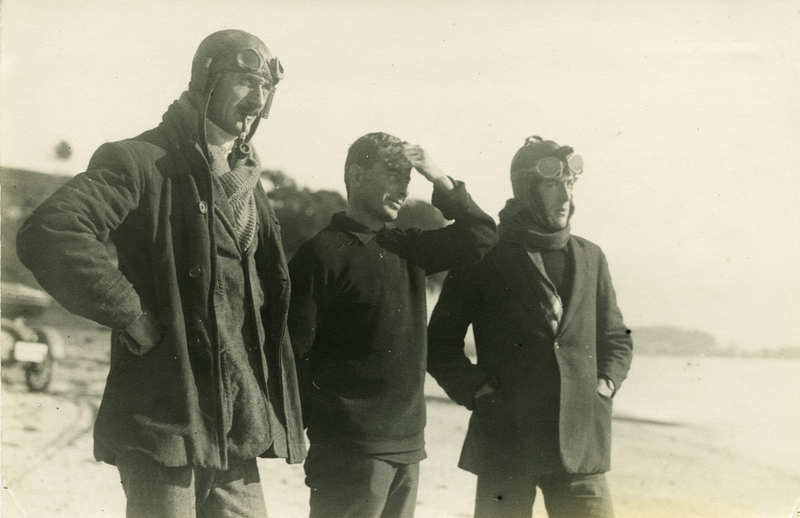 These two men helped to lay the foundation for both military and civil aviation in New Zealand. Leo (Austin Leonard) Walsh was born on 5 February 1881 at Bradford, Yorkshire, England, the eldest child of Jane Mary Towler and her husband, James Austin Walsh, a tobacco manufacturer. Leo’s sister Veronica Agnes was born in 1883 and soon afterwards the family emigrated to Auckland, New Zealand. There Vivian Claude was born on 6 November 1887, and Doreen Monica in 1895. Their mother died in 1904. Both Leo and Vivian showed an early interest in engineering and, encouraged by their father, Austin Walsh, they established a mechanical engineering and motor importing business in Auckland. Fascinated by accounts of aviation experiments in Europe and America, with other enthusiasts they formed the Aero Club of New Zealand in 1910. The brothers were determined to build and fly an aeroplane and succeeded in obtaining financial backing from Auckland business-men A.N. and C.B. Lester and A.J. Powley. They then bought the plans for a British Howard Wright biplane together with materials and an eight-cylinder engine worth about £750 in total. It took about 5½ months for the brothers to manufacture and assemble the aircraft at their family home in Remuera. They were helped by fellow enthusiasts, and their sisters Veronica and Doreen, who machine-sewed hundreds of yards of material for the wings. The finished aircraft, named the Manurewa No 1 bore an inscription "The Walsh Aeroplane Co. Aeronautical Engineers Constructors Auckland." Beneath this was a crest and the words "Aero Club New Zealand". The Manurewa (Soaring Bird) was dismantled and transported to Glenora Park, a private racecourse at Takanini, where, under the grandstand, it was reassembled for flight. Vivian was the first to fly the plane, and being careful, made several taxiing tests on the ground before his first successful flight of about 400 yards at a height of 60 feet in early February 1911. The flight was witnessed by a small group of local residents, Aero Club members and a proud family, and was to be followed by many more. Vivian kept detailed records and gradually built up knowledge of the controls and performance of the aircraft. Leo did not attempt to fly the plane as he feared his reactions were too slow, but he was a skilled designer and organiser. The brothers different talents made them a formidable team. The business syndicate, displeased with Vivian’s excessive caution, took possession of the Manurewa and soon after, it crashed and was damaged beyond repair. Recovering from this setback, Leo, with Vivian’s help, began to design a flying boat of the American Curtiss type which he thought would suit New Zealand conditions. The brothers gained the financial and practical assistance of R.A.Dexter, an American engineer and motor dealer in Auckland, who was to be a consistent supporter. After more than a year in construction the new aircraft was completed in November 1914 and transported to Bastion Point on the Waitemata Harbour. Here Vivian took it for its first flight on 1 January 1915. It was the first flying boat designed and built in the southern hemisphere and proved a great success. In March 1915 Vivian took the first of many passengers on a flight of five miles. With the outbreak of the First World War the military use of aircraft was soon recognised, and many would-be pilots in New Zealand wrote to the Defence Department asking how they could qualify to join the Royal Flying Corps. The Walsh brothers also received letters of enquiry and were eager to set up a training school. With some difficulty they persuaded the New Zealand government to back the idea and approach the British authorities. The response was very encouraging; the RFC asked for as many candidates as could be trained and agreed to issue an aviator’s certificate by cable to each trained pilot, provided the qualifying flight was witnessed by official military observers. The New Zealand Flying School was formed by the Walsh brothers and began training pupils in October 1915. Headquarters were established first at Orakei, and in November on the foreshore at Mission Bay. Leo Walsh was managing director, Vivian Walsh was chief pilot and superintendent, R.A.Dexter was director and Austin Walsh was secretary. Both Doreen and Veronica Walsh were involved in the practical running of the school. As well as providing flying instruction, the school built and maintained aircraft, so various other staff including engineers and mechanics were taken on. Some ex-pupils later became flying instructors. George Bolt, who later became the Chief Engineer at TEAL, was one of those employed both as a pilot and an engineer. It could be said that the Walsh brothers contributed to the founding of aviation engineering as we know it today in this country. In February 1916 the school gained Imperial recognition which brought with it the official involvement of the New Zealand Defence Department, and elements of military training were incorporated into the school’s programme. The first pilot’s certificate was issued to Vivian Walsh on 13 July 1916. 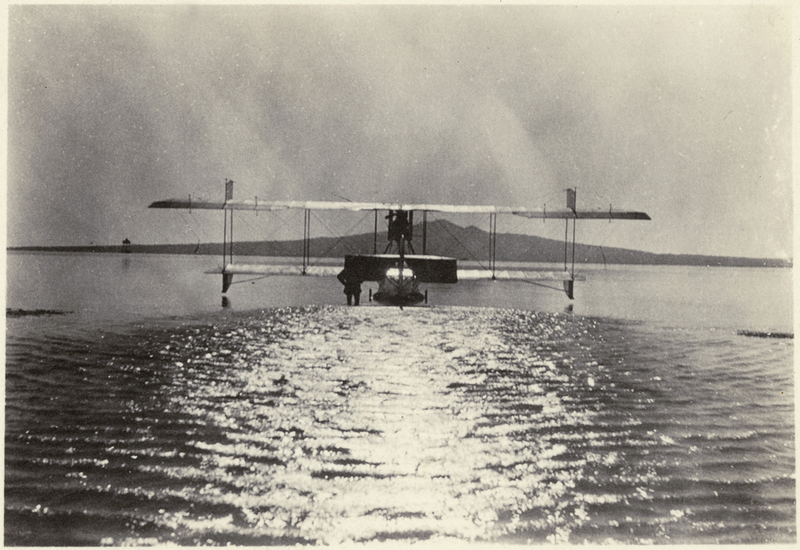 The school obtained its second aircraft in November 1915 and other planes, including the first two Boeing float planes constructed were acquired later. Over 100 pilots were trained during the war; most saw combat and many gained honours and decorations. The most famous was Keith LoganCaldwell, one of the original three pupils. Vivian, who had set high standards for training, was forced to give up flying in 1919 because of ill health and instead helped Leo to manage the school. At the end of the war it seemed that the New Zealand Flying School might no longer be needed, but the Bettington Report on aviation (1919) recommended that this and the Canterbury (NZ) Aviation Company’s flying school be maintained. In 1920 the government voted £25,000 to keep the schools in existence, but only a small proportion of this was advanced to the New Zealand Flying School. Nevertheless, it served to keep the hopes of the Walsh brothers alive. Meanwhile, they became involved in other projects. In late 1917 Vivian had given demonstration flights at Napier showing the potential use of aircraft for passenger and mail services. In 1919 Leo raised with the government the possibility of establishing an airmail system, and on 16 December that year the first official airmail flight in New Zealand took place between Auckland and Dargaville. Other experimental mail flights to Thames, Whangarei and Dargaville were arranged, and a regular service between Auckland and Whangarei was introduced on 9 May 1921. This lasted only a short time as it proved to be uneconomic; regular passenger flights did not start for many years for the same reason. With Arthur Upham as pilot, Leo Walsh carried out survey flights for the Fijian colonial government in July 1921 in an attempt to demonstrate the use of aircraft in communications. Very soon the financial burden of operating the flying school became too onerous. Leo and Vivian Walsh struggled to keep the school in existence by offering pleasure flights and undertaking charter work. By 1923 they had exhausted their resources and asked the government to take over the school. In October 1924 the government bought the assets of the New Zealand Flying School for about £10,500 – insufficient, Leo Walsh noted, to give any return to shareholders in the venture. Bitterly disappointed, Leo and Vivian Walsh gave up all involvement in aviation and returned to their engineering business, which from the late 1920’s was located in Hobson Street, Auckland. Vivian died on 3 July 1950 and Leo on 16 July 1951; neither had married. While the brothers received no official recognition during their lives, in 1952 the Auckland Branch of the New Zealand Division of the Royal Aeronautical Society initiated the Walsh Memorial Fund to further the interests of aviation and to perpetuate the names of two aviation pioneers.